Hytec supply a vast range of carbon filters in all sizes, air flow ratings & budgets from the leading brands & manufacturers to suit your needs, feel free to call us on any of your ventilation requirements or advice. 250MM X 600MM RAPID AIR MOVEMENT CHARCOAL FILTER The 250mm RAM carbon filter from Rapid Air Movement is one of the best value charcoal filters available today. The high quality 12inch RAM filter runs at 1080 m3/hr is 250mm neck and a length of 600mm. 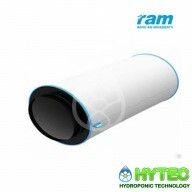 The RAM Pro Active Carbon Filter ..
CARBOAIR 50 250MM X 500MM 1200M3/H CarboAir™ 50 has been developed to filter VOCs (Volatile Organic Compounds) from smaller grow room environments.CarboAir™ 50 has a 50mm bed of virgin activated granular carbon. It is the best filter for normal use in smaller grow rooms. A 50mm bed of carbon is p..
CARBOAIR 60 250MM X 660MM 2000M3/H CarboAir™ 60 has been developed as we have found higher concentrations of VOCs in the exhaust air from medium an larger grow environments with stronger strains. 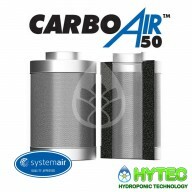 CarboAir™ 60 has a deeper carbon bed of 60mm and a longer body. This provides a longer c..
Phresh®: 250mm x 600mm: 1250m³/hr air flow. Why choose a Phresh® filter? Phresh® manufacture Multiple Size Filters with some of the best air flow ratings in the market and are an excellent choice for your grow room filtration needs. 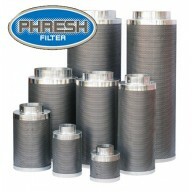 Phresh® Filters are a high-quality filtration&..
Phresh®: 250mm x 1000mm: 2000m³/hr air flow. Why choose a Phresh® filter? Phresh® manufacture Multiple Size Filters with some of the best air flow ratings in the market and are an excellent choice for your grow room filtration needs. Phresh® Filters are a high-quality filtration..
CARBOAIR 50 250MM X 1000MM 2500M3/H CarboAir™ 50 has been developed to filter VOCs (Volatile Organic Compounds) from smaller grow room environments.CarboAir™ 50 has a 50mm bed of virgin activated granular carbon. 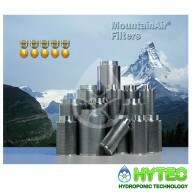 It is the best filter for normal use in smaller grow rooms. 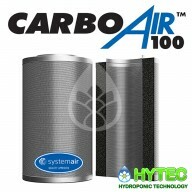 A 50mm bed of carbon is ..
10" MOUNTAINAIR® FILTER 250MM X 800MM 1870M³/HR ELIMINATE ALL ODOURS NOW! MountainAir® filters are a range of filters which have been designed to give maximum quality, performance and durability. 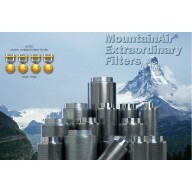 No other filter has been able to last more than 3 years of constant use, so you can be assured it ..
MountainAir® Filter 1040g: 250mm x 1000mm: 2380m³/hr air flow. ELIMINATE ALL ODOURS NOW! MountainAir® filters are a range of filters which have been designed to give maximum quality, performance and durability. No other filter has been able to last more than 3 years of..
CARBOAIR 60 250MM X 1000MM 3100M3/H CarboAir™ 60 has been developed as we have found higher concentrations of VOCs in the exhaust air from medium an larger grow environments with stronger strains. 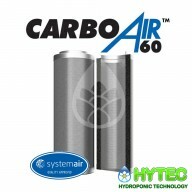 CarboAir™ 60 has a deeper carbon bed of 60mm and a longer body. 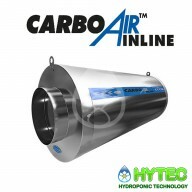 This provides a longer ..
CARBOAIR INLINE 250MM X 740MM 1250M3/H CarboAir Inline filter, are designed so you can mount your filter outside your grow room. You can simply duct the air out of your grow room and into your inline filter to scrub the odours. If space is tight it is the perfect solution. Inline filters..
10" CARBOAIR 100 250MM X 3800M3/H SUPERIOR CABON FILTERS CarboAir 100 has been developed to filter very high concentrations of VOGs from larger rooms CarboAir 100 has a huge 100mm bed of virgin activated carbon. This, coupled to our industry leading steel mesh,is the most effe..
​10" CARBOAIR 100 250x1000 5800M3/H SUPERIOR CABON FILTERS CarboAir 100 has been developed to filter very high concentrations of VOGs from larger rooms CarboAir 100 has a huge 100mm bed of virgin activated carbon. This, coupled to our industry leading steel mesh,is the most effectiv..